January 7 2014. Announcement of Official USATF 2014 Club Grand Prix results. In each event, 10 points are awarded for a first place team finish; 8, 6, 5,4,3,2,and 1 point awards are made to teams finishing 2nd through 8th respectively. Each team may compete in as many events as they choose but must compete in at least 3 events to be eligible for Grand Prix awards. At the end of the year, the scores from the 5 best results for each team are summed to give a grand total. Fourth through 8th place teams receive a Team Grand Prix certificate; the 3rd place and 2nd place teams receive a $250 and a $500 cash prize respectively along with a certificate. The first place team receives a $1000 cash prize and a clubhouse banner in addition to the certificate. Numerical ties are typically broken by looking at head-to-head competition and then the number of event championships won. The Genesee Valley Harriers from Greater Rochester NY, the Playmakers Elite/New Balance team from Lansing MI, and the Athena Track Club of Malvern PA, had the most success over the four different age groups on the women’s side. Genesee had two firsts and a second place finish; Playmakers had a first, a second, and a 6th place finish; Athena had a first and a second place finish. Fourth through 8th included, in order, The Janes Elite Team (Southern California), Team Colorado [CO], Playmakers Elite/New Balance [Lansing MI], Dave’s Racing Team [Northwest Ohio], and Team Rogue [Austin TX]. Fourth through 7th included, in order, the Athena Track Club B team, Heart and Sole Harriers [Boulder CO], A Snail’s Pace Running Club [Southern California], and Team Ohio [Northern Ohio]. Three teams tied for 8th: Boulder Striders [CO], Team Runners High [Long Beach CA], and Club Northwest [Seattle WA]. Revolution Running [Louisville CO] and Tri-Valley Front Runners [Central and Eastern Massachusetts] tied for 4th, and the Atlanta Track Club [GA], Boulder Road Runners [CO], and Liberty Athletic Club [Boston MA] tied for 6th. The Atlanta Track Club from Georgia and the Ann Arbor Track Club of Ann Arbor MI, had the most success over the four different age groups on the men’s side. Atlanta took a first, two seconds, and a third place. Ann Arbor had two first place finishes. Not far behind in excellence across the age groups were the Cal Coast Track Club [Southern California] with a 2nd, a 4th, and a 6th and the Genesee Valley Harriers [Rochester NY area] with a 2nd, a 5th and a 7th place finish. As above with the Women's teams, one could assign points (10 for 1st and so on) to give a numerical rank order for excellence across the age divisions of: Atlanta 32; Ann Arbor 20; Cal Coast 16; and Genesee 14. Fourth through 8th included, in order: the Boston Athletic Association [MA], Patient Endurance Racing [Lansing MI], Baltimore Washington Athletic Club [D.C.], Genesee Valley Harriers [NY], and the Boulder Running Company/Adidas [CO]. Fourth and fifth went to the Cal Coast Track Club and Club Northwest respectively. Four teams were tied for 6th: Athletics Boulder [CO], River City Rebels [CA], Playmakers Elite/New Balance B team [MI], and the Purdue Area Track Club [W Lafayette IN]. Fourth through 8th included, in order: Boulder Road Runners [CO], Genesee Valley Harriers [NY], Cal Coast Track Club [CA], Raritan Valley Road Runners [Central NJ], and the Athletic Annex Running Club [Indianapolis IN]. 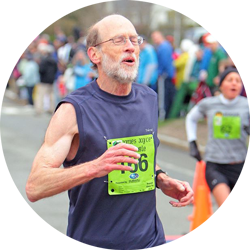 Fourth was the Clifton Road Runners [Northeastern NJ], with the Santa Barbara Athletic Association [CA] and the New England 65+ Running Club [MA/New England] tied for 5th. The A team of the Boulder Road Runners [CO] was in 7th, followed by the Boulder Road Runners Team B [CO] and the West Valley Joggers and Striders [Northern CA] tied for 8th. [Category not recognized for an award by USATF MLDR] Top placement goes to the Genesee Valley Harriers with my assigned points totaling to 42.The only other top performing team on both the men's and women's side was Atlanta who would have 8 points on the women's side for their 3rd and their tie for 6th place. So Atlanta has 40 points combined for the 2nd best total in this category. Congratulations to all of these teams for their perseverance and for making the effort to attend and excel at as many USATF Masters LDR events as possible!